There are many types of food toys and puzzles made for dogs these days! Here are just a few of the ones in our toybox. Food toys are great for any dog, but are especially good for blind/deaf dogs. Many b/d dogs don't play with other types of toys because they can't see or hear the toys, so there is nothing to grab their interest. With food toys, they can smell the food, so they have something to keep their interest and encourage them to interact with the toy. 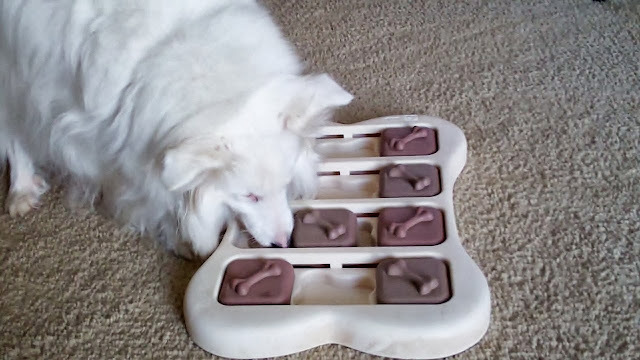 Dogs like food and by hiding the food in different toys and puzzles, we can give them something challenging to work for. Food toys teach problem solving skills, as the dog has to try different methods to get the food to come out. Giving a dog the mental exercise of a food toy is good exercise. Mental exercise often will tire a dog more than physical exercise. Dogs that gulp their food too fast will have to eat slower when eating their meals from a food toy. This can aid in digestion and prevent vomiting caused by swallowing too much food too quickly. Some food toys are easier than others, and it's best to start with easier toys until your dog gets the idea. For some of my foster dogs that have not had toys before, I even start with a plastic cup or yogurt container placed on its side with a tasty treat inside. Even with the treat so accessible, some dogs find it difficult at first to figure out how to stick their nose inside to get the treat. Then I would use a Kong toy and put some loose treats or kibble inside so it fell out easily when the Kong was bumped. Then progress to sticking the treats inside with something sticky like peanut butter, and so on. Some food toys have levels of difficulty that can be set on the toy itself so you can control how easily the food falls out. By having different types of food toys, I can rotate which dog gets which one and give them some variety. Each toy and puzzle has a different strategy to get the food out. 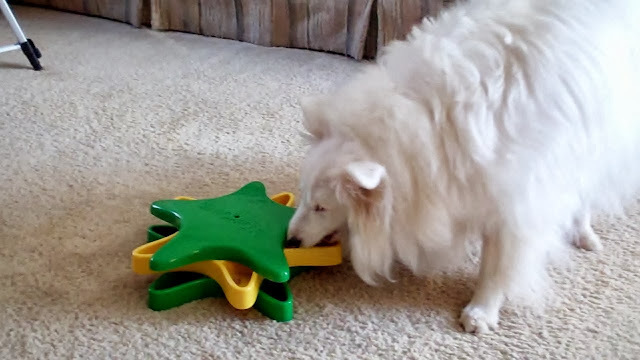 Sometimes it gets too easy if the dog always gets the same puzzle or toy over and over again - they know just what to do to get the food to come tumbling out! By mixing it up, they have to really think about it and experiment. Treasure sure does love her food puzzles and toys! Treasure's favorite food toy? Why, the one with the tastiest treats in it, of course! I prefer rubber or plastic food toys which are easy to keep clean. The rubber ones just go in the top rack of the dishwasher or can be washed in hot soapy water, as can the plastic ones. Depending on your dog, some of these food toys should not be left with it unsupervised. The rubber food toys that I have are safe for me to leave with my own dogs unsupervised, but make sure you supervise your dog the first few times it uses them. The plastic ones I won't leave with my dogs unsupervised, since plastic is less durable and more easily chewed!